Ever wondered when a specific vegetable is in season? This is a question that appears much more often than what many believe. The infographic that you can see below comes to solve this problem for you. You will find the most common vegetables listed and you can easily refer to it whenever you need to. To make everything even more interesting, the infographic does not only talk about the various different vegetables and when they are available. You are also offered many interesting tips that you can take into account in order to get the best tasting vegetables. As an example, let’s look at peppers, the first vegetables mentioned in the infographic. Did you know that you need to choose the pepper that is heavy in order to be sure that it is juicy and ripe? Or did you know that in order to maximize carrot freshness for a long period of time you should store them in moist paper towels or in sealed bags made out of plastic. This aids the carrots to be fresh for a much longer period of time. We all know that vegetables are important for nutrition purposes. It is very important that you take into account having a really healthy nutrition plan. Everyone’s diet needs to include vegetables as they are really rich in various nutrients you cannot get in suitable quality in dishes without them. Make sure that you also include fruits. Many do so but tend to forget about vegetables. Also, we have problems with putting our hands on very good options since there are not many opportunities available for those looking for vegetables. What you may not know is that you cannot actually find vegetables that are fresh in the supermarket. 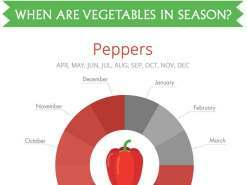 You have to check the infographic and see exactly when you can find vegetables that are in season and when they are not actually what is advertised. The infographic will surely help you out a lot at the end of the day. Make sure that you go to farmers markets whenever you notice that the correct vegetables are in season. Analyze the opportunities available for you so that you can actually buy the really good vegetables, the ones that are exactly as they should be.